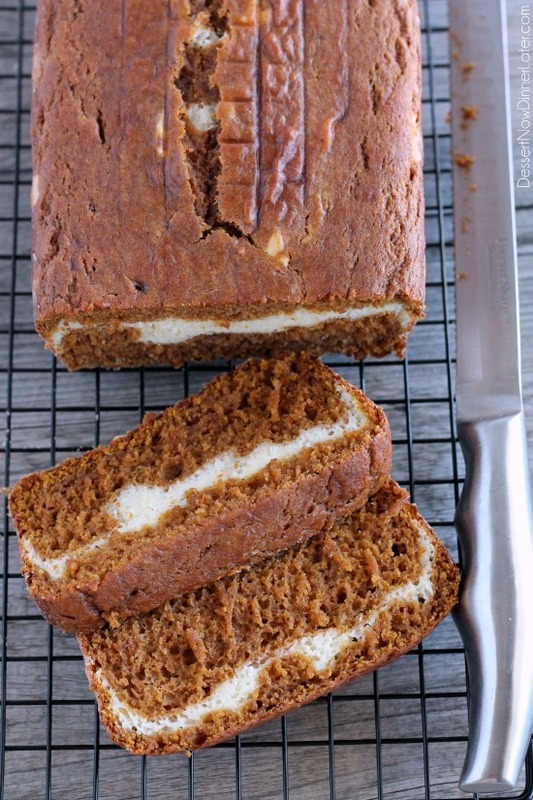 Cream Cheese Filled Pumpkin Bread - Dessert Now, Dinner Later! OR … you get the idea! I’m always a huge fan of the classic Pumpkin Roll with whipped cream cheese frosting, and I can’t wait to make my Gingersnap Pumpkin Cheesecake every Thanksgiving, so why not make more pumpkin and cream cheese desserts? 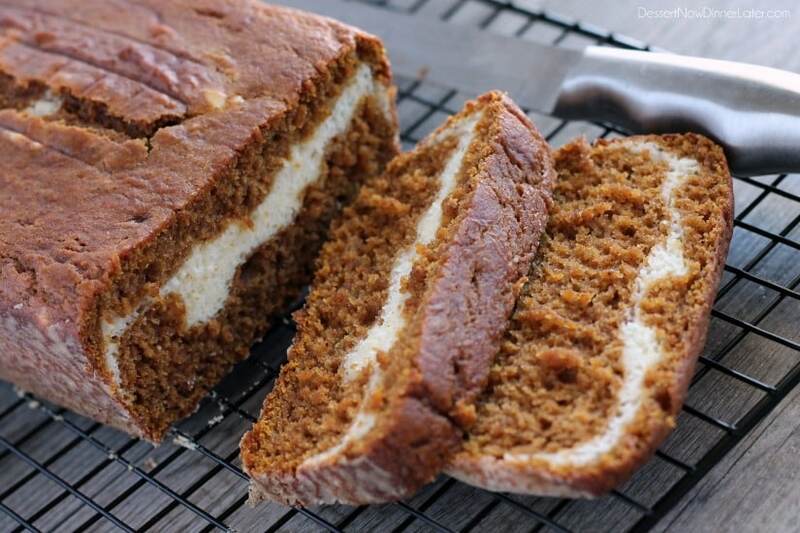 Hence, this Cream Cheese Filled Pumpkin Bread! The thing I love about this dessert is that it’s quick to whip up, it is a quick bread after all, but I was intrigued by one ingredient in particular found in the cream cheese layer – FLOUR! I was like, “WHAT? 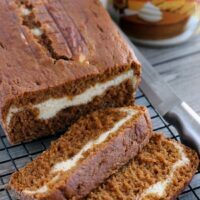 !” I was interested to see what it did, so I made this recipe and was pleasantly surprised to see that it makes the cream cheese layer the same texture as the rest of the bread, plus it’s really eye catching to see that pop of white against the orange loaf. 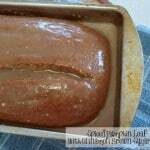 This cream cheese filled pumpkin loaf is nice and moist too, just the way it should be and would be great to package and send to neighbors as holiday gifts! Enjoy! Preheat oven to 375 degrees Fahrenheit. Grease and flour one 9x5-inch loaf pan. In a large bowl, whisk to combine the egg, pumpkin, brown sugar, granulated sugar, oil, sour cream, vanilla, cinnamon, pumpkin pie spice, and nutmeg. In a separate bowl, combine the flour, baking powder, baking soda, and salt. Fold dry ingredients into wet ingredients until just combined; don't over-mix; set aside. In a large bowl, beat the egg, cream cheese, granulated sugar, and flour with a hand mixer until smooth. Pour ⅔ of the pumpkin batter into the prepared bread pan, smoothing the top and spreading to the corners. Drizzle the cream cheese batter on top, completely covering the pumpkin layer underneath. 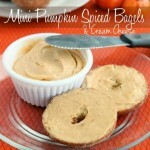 Gently dollop spoonfuls of the remaining pumpkin batter over the cream cheese layer and gently smooth over with a spoon. Bake for 48 minutes or until the top is domed, golden and the center is set (bread will spring back when touched). *TIP: Cover bread with a sheet of foil the last 15 minutes to prevent too much browning. Allow bread to cool in the pan for about 15 minutes before turning it out onto a wire rack to cool completely before slicing and serving. Store in an airtight container up to 1 week. This looks delicious! I love anything with cream cheese! 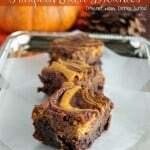 Mmm this looks so yummy and perfect for fall!! Oh my gawsh….I’m wiping up the puddle of drool that’s all over my keyboard—this bread looks totally amazing, Amber! Love love the pretty white cheesecake contrast against the super-moist looking pumpkin part! SO can’t wait to try this bread. 🙂 Pinned! I love the pop of white on the orange bread too! Thanks for pinning Sarah! 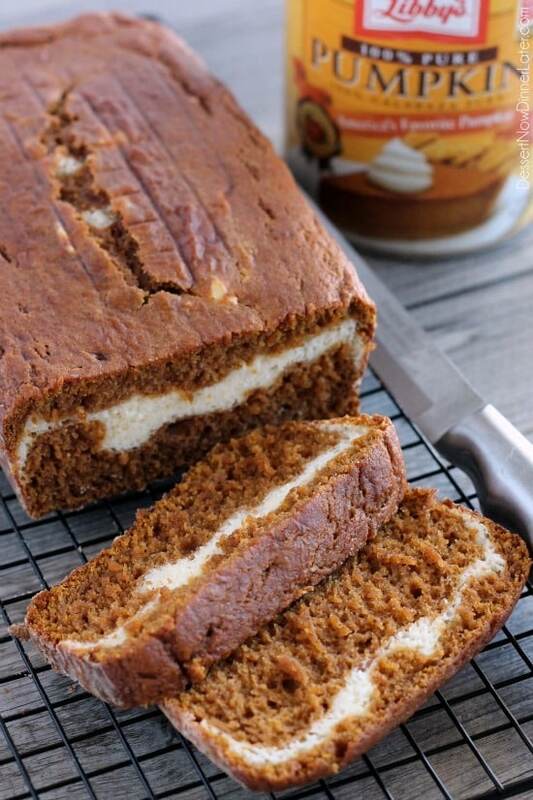 Love pumpkin bread and this one looks gorgeous with that pretty cream cheese filling! It looks so moist and tasty and I’m totally wishing I had a few slices of this now! I wish I had more for a snack right now, haha! Love the layer of cream cheese! This bread looks so good! I love it too! It’s fun to look at and eat! Thanks Jessica! It should be just fine. The flour in the cream cheese batter makes it the same texture as the rest of the bread, and these kinds of breads freeze well. If I use mini baking pans will I need to modify the cooking time?